Gill - Yesterday (05/28) I once again had the pleasure of surveying our neighbor's property ('Blake Farm') to the SW of Mountain/Main Roads in Gill. Conditions were pleasant beginning with a cool 45 deg F start ranging through to the upper 60s by the time I finished just before noon. Perhaps the cooler start influenced bird behavior but it wasn't until after 09:00hrs that the tempo really began to pick up. Indeed, the most productive period was the last hour. Compared to my last visit on May 8th, species diversity was way up as might have been expected for late May. There was no strong evidence of any migration other than a couple of isolated species and there was a distinctly curious absence of some species that might have been expected such as Downy Woodpecker, Warbling Vireo, Wood Thrush, Magnolia Warbler and Least Flycatcher. On the upside, quite a few species had arrived since my last visit and were present in numbers: Alder Flycatcher (2 singing with nest building observed)), Great Crested Flycatcher (3), Eastern Wood-Pewee (4), Red-eyed Vireo (14), Gray Catbird (10), Chestnut-sided Warbler (8), Veery (10), Scarlet Tanager (5) and Indigo Bunting (4). The most interesting species included Red-shouldered Hawk, singing Black-billed and Yellow-billed Cuckoos and a pair of Olive-sided Flycatchers. The latter were vocalizing in potentially suitable breeding habitat and the male responded aggressively to a few bursts of playback. Olive-sided Flycatchers are among the very latest of passerine migrants to pass through Massachusetts in spring, so with this in mind I'll be keeping a careful eye on this pair into June. However, they're also known to be "very uncommon" and localized breeders at higher elevations in the western part of the state so the potential would certainly seem to be there as the habitat looks ideal. The same habitat also has breeding White-throated Sparrow, Indigo Bunting and Eastern Towhee to mention just a few. All in all, it was a tremendously successful survey recording over 60 species. Olive-sided Flycatcher (three images above). Eastern Towhee and White-throated Sparrow among others. After dropping Matan off at school I decided to have a quick spin around Gill, driving with the windows down as I often do at this time of year. The reward was hearing a fine male Cerulean Warbler holding territory at a private residence right next to one of the busiest roads in Gill! At one point I saw the male carrying food, perhaps suggesting breeding activity. By way of documentation, I obtained some nice sound recordings of the male's song and a couple of images, but for most of the observation the bird remained high in the canopy. Cerulean is something of a rarity for me in the Pioneer Valley and this is the first that I've recorded in Gill. Cerulean Warbler - male in Gill, Franklin Co., MA. May 29th, 2013. Down at Barton Cove the heavy overnight rain and dull drizzly conditions certainly seemed to have had an impact and produced one of the best collections of birds that I've ever seen there in spring. In fact, by recent standards the birds present provided a near-miraculous hour of birding! First to catch my attention was a migrant Common Loon. Closer inspection of the cove also produced a lone drake Gadwall which seemed odd for late May. An excellent selection of swallows hawked over the water composed mainly of Bank, North Rough-winged and Tree Swallows but also some Barn and a single Cliff Swallow. Although distant, the island across from the boat ramp had enough exposed shoreline to host 22 Semi-palmated and 3 Least Sandpipers, along with a single Semi-palmated Plover as the well as the local breeding Spotted Sandpipers. I also heard one or more of Black-bellied Plover(s) and Short-billed Dowitcher(s) fly over but had no chance of seeing them in the murky skies. Common Loon - Barton Cove, Gill, Franklin Co., MA. May 29th, 2013. At about 09:45hrs, three terns arrived from the south and began calling and foraging around the cove. Two were fairly clear adult Common Terns but one looked much paler winged. Initial thoughts towards Arctic were soon dismissed as the bird looked large with a substantial orange-red bill that had a well defined black tip. Viewing conditions were far from easy and it wasn't until all three birds settled on a floating tire that I became 100% sure that I was looking at an adult Forster's Tern. Moreover, recent experience from Ohio proved invaluable in helping separate Common from Forster's, an identification which I don't find particularly easy in adult breeding plumage. But.......Forster's Tern is certainly a first for me in Gill - on reflection I don't recall ever hearing about a Forster's Tern in the Pioneer Valley since we first moved to Amherst back in 2005. Forster's Tern - adult with Common Terns, Barton Cove, Gill, Franklin Co., MA. May 29th, 2013. In each of the three shots above, the Forster's is the larger, paler bird with pale primaries on the right side of the tire. Digi-scoped at range using a Swarovski HD scope and Canon Powershot G10. Forster's Tern - adult, Barton Cove, Gill, Franklin Co., MA. May 29th, 2013. Perhaps overshadowed by warblers in glorious spring finery, a seemingly underrated aspect of our time at Magee Marsh was the ease at which cryptically plumaged ground dwellers could be seen. American Woodcocks, for example, were seen in broad daylight on each day at Magee easily making this the most reliable spot that I've been to for actually 'seeing' woodcocks. I was somewhat prepared for this having visited the previous year. However, I wasn't prepared for the three individual roosting Eastern Whip-poor-wills that we encountered on our tour. Finding roosting whip-poor-wills on migration struck me as something of a rare event and at least one of these was initially glossed over as a (more likely) roosting Common Nighthawk. The 'duller' wood-warblers included daily Ovenbirds and Northern Waterthrushes, whilst many of us had our best views ever of Louisiana Waterthrush which put on the most fantastic show on the 12th. American Woodcock - parking lot, Magee Marsh, Lucas Co., OH. May 12th, 2013. American Woodcock - Magee Marsh, Lucas Co., OH. May 12th, 2013. American Woodcock - parking lot at dusk, Magee Marsh, Lucas Co., OH. May 11th, 2013. Eastern Whip-poor-will - parking lot, Magee Marsh, Lucas Co., OH. May 12th, 2013. This bird was kindly showed to us by Steve Bird and Gina Nichol. Eastern Whip-poor-will - Metzger Marsh, Lucas Co., OH. May 15th, 2013. Eastern Whip-poor-will - Magee Marsh Boardwalk, Lucas Co., OH. May 16th, 2013. Ovenbird - Magee Marsh, Lucas Co., OH. May 12th, 2013. Louisiana Waterthrush - Magee Marsh, Lucas Co., OH. May 12th, 2013. Kirtland's Warbler - male, Huron NF, Crawford Co., MI. May 20th, 2013. Every once in a while a bird species captivates my interest more than others. Looking back I can think of the multiple Firecrests that I found in my local woodland in Sheffield when I lived in the UK, beginning with the first way back in 1980. Then Pallid Scops-owl really caught my imagination when I found several individuals wintering in remote Acacia wadis in the southern desert of Israel in the late 90s, subsequently resulting in two successive winter surveys of that species. Those surveys discovered at least 23 individual birds in each season. My recent experiences with Kirtland's Warbler have had a similar impact on my imagination. Of our recent nine day tour to Ohio/Michigan with Birdfinders, we saw Kirtland's Warblers on four days including two individual migrants on the beaches at Magee Marsh in NW Ohio, and several singing birds on territory in the Huron National Forest to the east of Grayling, Michigan. Handsome, sharp-looking, ultra-rare and with strict habitat preferences, Kirtland's has an extremely charistmatic song which adds even more to the mystique of the species from my perspective. Kirtland's Warbler - female, East Beach Trail, Magee Marsh, Lucas Co., OH. May 14th, 2013. Kirtland's Warbler - migrant, first-summer male, West Beach, Magee Marsh, Lucas Co., OH. May 15th, 2013. 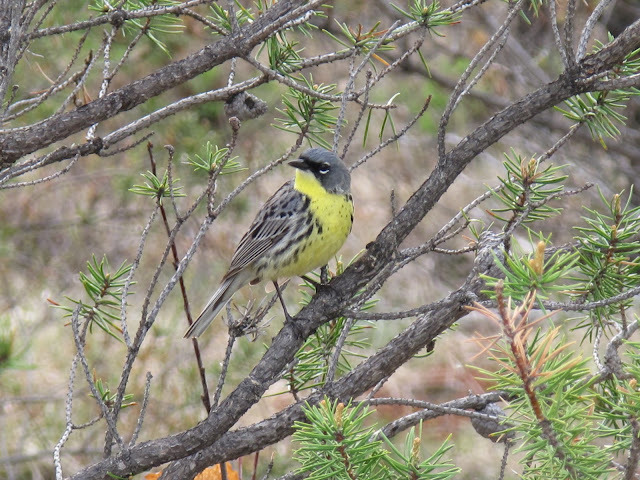 Kirtland's Warbler - male on territory, Huron NF. Crawford Co., MI. May 18th, 2013. -Kirtland's Warbler - male on territory, Huron NF. Crawford Co., MI. May 20th, 2013. The last two days have seen a distinct shift in tempo for our tour. With migration slowing a little at Magee Marsh we've been able to concentrate on finding some of the scarcer breeding species in Ohio and Michigan. We also added two species to our ever growing warbler list for the tour, finding Blue-winged yesterday at Oak Openings and Cerulean today near Ann Harbor in Michigan. The highlight would have to be the Henslow's Sparrows that we found singing today (05/17) near Ann Harbor before embarking on the long drive to Grayling, MI. Acadian Flycatcher - singing bird near Ann Harbor, MI. Cerulean Warbler - singing male near Ann Harbor, MI. Eastern Whip-poor-will - Magee Marsh, NW Ohio. May 16th. 2013. Remarkably, our third roosting 'whip' of the tour. Henslow's Sparrow - near Ann Harbor, MI. Red-headed Woodpecker - Oak Openings Preserve, NW Ohio. May 16th, 2013. Each new day in NW Ohio seems to upstage the previous one as the Birdfinders tour seems to find itself in the right place at the right time with the most incredible fortune. The day began stormy with winds out of the SW and it was clear from the outset that huge numbers of birds were dropping into and around Magee Marsh. Large flocks of Blue Jays, Cedar Waxwings and Pine Siskins filtered along the Lake Erie shore for most of the first two hours of the morning. The trees and bushes were heaving with American Redstarts, Magnolia Warblers and Northern Parulas. Indeed, during the course of the day we tallied an almighty 27 species of wood-warbler including no less than 22 in the tiny woodlot in the end of Bono Road at Metzger Marsh. Miraculously, another Kirtland's Warbler was found today just 100 yards west of our lunching spot on the beach at Magee. This bird, likely a first-summer male, was a tad brighter than yesterday's female at the East Beach which had apparently been seen again in the morning. To round off yet another brilliant day we enjoyed a female Golden-winged Warbler, an Orange-crowned Warbler and a roosting Eastern Whip-poor-will all in the tiny woodlot at Metzger Marsh. Canada Warbler - male, Metzger Marsh, NW Ohio. Kirtland's Warbler - first-summer male, West Beach, Magee Marsh, NW Ohio. Eastern Whip-poor-will - Metzger Marsh, NW Ohio. Orange-crowned Warbler - Metzger Marsh, NW Ohio.